A woman cries as a man lays dying, desperately they beg you to stop a cryptic killer before their friends suffer a similar fate. Welcome to Halloween 2016! This event is available in both members and free-to-play worlds. 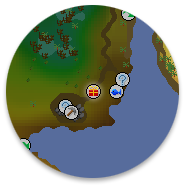 Make your way to Lumbridge Swamp, speak to the grieving Abigale and she'll lend you her boat to track down this mysterious killer. Unfortunately, the boat isn't very sturdy. You'll need to leave all your items in the bank if you wish to stop the killer. Should you manage to survive the night, for completing this event you will be rewarded with a scream inducing mask and a set of robes to match, as well as the killer's own blade. A new, deathly wallkit for your player-owned house. Red, blue and green h'ween masks. An additional green skin colour from the Makover Mage. As is tradition for holidays in Old School, we'll be making use of our rotten potatoes to spawn some spooky Halloween items! If you want to get your hands on some h'ween loot, keep an eye on the Old School Twitter and watch out for in-game broadcasts. Worlds 360 & 338 have been reverted from Deadman Seasonal to regular worlds. Blocked mithril seeds in Clan Wars. Unfiltered some messages from the gem bag. Fixed some animation issues with the heavy casket. You can no longer initiate combat with an NPC straight after it has been pickpocketed. Spirit trees now have the usual teleport delays on DMM worlds. During the developer Q&A taking place later today we will be making an announcement that you won't want to miss. Be sure to tune in over on the RuneScape Twitch channel at 5pm BST! 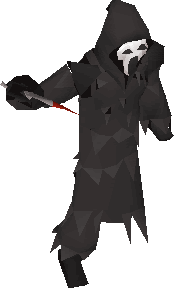 Any plans to revisit the hard karamja diary reward that allows players to sell items for 1.75x of low alch value (in Tai Bwo Wannai general store), to instead be an elite karamja diary reward? I recall this being considered on a dev Q&A earlier this year, but nothing has been done to address this since then as far as I can tell. Achieved 2277 total on August 5th 2014. Looking forward to do the event. Question, any idea when the sandworm rate will be increased?